YOU’LL BE “CRUCIFER-IED” FOR EATING THESE FOODS! Cabbage gets a bad rap because it’s so often boiled with corned beef. While corned beef needs to be boiled for a long time, cabbage just loses flavor the longer past al dente it cooks. If your only other exposure to cabbage is that poorly made deli-style coleslaw the above sentiment is justified, as it would be for most veggies eaten that way. If St. Patrick’s Day is the only time you ever eat cabbage (save perhaps for the mayonnaise-laden coleslaw at the deli or maybe some super-salty sauerkraut on a hot dog) then it might be worth another look at this incredible food. Never in my wildest days did I ever think Brussels sprouts (also a “cruciferous” veggie) would be an “in” food. Ditto kale. Indeed, kale got so “in” it’s now almost out (but the nutrition stays). Of course, like cabbage, if you’ve always associated Brussels sprouts with boiled-to-death soggy spheres, you’ll hate them. Tossed with olive oil and roasted however, maybe with some walnuts or pine nuts at the end, makes them a whole other ball game. Even better for kids, sliced or “shaved” disguises them completely and turns them into a great stir-fry with onions and any other veggie. All those great healthy compounds in cruciferous veggies are also a source of flavor. They just need some herbs and spices to complement them. Stir-fries have done wonders to awaken people to the flavor of cruciferous veggies. Here’s my recipe for my fool-proof “Quick, Colorful, Cruciferous Stir-Fry Medley”. Delicious, fast, and super-healthy. Roasting cruciferous veggies, like Brussels sprouts, cauliflower, and broccoli makes them almost irresistible, and they take added herbs and spices like garlic, oregano, and cardamom very nicely. Of course, there’s always my go-to addition, grated parmesan or pecorino. Even just a teaspoon amps up the umami quotient. Kids love finger food, and roasted veggies make great finger food. Get them eating these veggies with their fingers, then deal with etiquette issues later. Bonus: What’s St. Patrick’s Day without soda bread? Get “My Mistake Brown Irish Soda Bread” recipe that I tweaked from Cook’s Illustrated’s version. http://cuttothechasenutrition.com/wp-content/uploads/2016/10/logo10.png 0 0 Keith-Thomas Ayoob http://cuttothechasenutrition.com/wp-content/uploads/2016/10/logo10.png Keith-Thomas Ayoob2018-03-16 21:28:502018-06-06 18:46:39YOU’LL BE “CRUCIFER-IED” FOR EATING THESE FOODS! It’s January, and that means US News has issued its “Best Diets” rankings. Out of the 40 diets ranked, both the DASH diet and the Mediterranean Diet tied for first place – again. Why? They have the most research behind them and they’re both great for your health. The DASH diet (Dietary Approaches to Stop Hypertension) was created to reduce high blood pressure and the Med diet is intended for heart health – two very common health conditions. Both diets emphasize plenty of fruits and vegetables. The main difference is that DASH also emphasizes at least 2 to 3 servings of low-fat dairy foods daily. The Med diet is strong on heart-healthy fats like olive oil, nuts, and fish, like salmon, because of its high omega-3 fat content. The Med diet can be a bit low on calcium, due to the modest intake of dairy foods. The Flexitarian Diet approaches vegetarianism but not obsessively so. I like this approach. It takes the best from the vegetarian diets but the only thing it banishes is the absoluteness. You don’t have to choose a camp here. For many people, veg is fine – but not all the time. This diet , and so supports this thinking, and so do I. Plus, it’s actually very healthful. What I love about the DASH, Mediterranean, and Flexitarian diets is that they’re basically eating styles. You can lose weight on them, but they can be a way of eating for the whole family, even the kids. This is ideal for families where one person is trying to lose weight, but doesn’t want to make, or eat, different food from the rest of the family. These diets are all about healthy (and tasty) eating. They also take no special work, don’t require exotic food, and have enough options for everyone. • All fruits and veggies – and 5 portions of them (at least!) daily. • Low-fat dairy foods of the DASH diet Aim for 3 servings but at least 2 (that’s still an improvement for most). • Extra-virgin olive oil, fatty fish, nuts, and sure, a glass of wine (if you drink). Basically a Med diet with more low-fat dairy foods. More inclusive, flexible, less limiting – IOMO. COULD “REVERSE RECESS” IMPROVE BOTH TEST SCORES & DIETS? I’ve said forever that kids who eat breakfast do better in school. A growing pile of research also suggests that “reverse recess”, that is, having some physical activity before – not after – lunch, may also contribute to better test scores. This reverse recess also seems to help0 kids want to eat more of what they need. The latest study included 1350 students in Texas elementary schools and looked at the differences in intake and test scores when schools scheduled recess before or after lunch. I love research like this. It’s simple and shows real results. When students (third, fourth, and fifth grade students) had recess before lunch, they scored higher on the “3Rs” – reading, writing, and arithmetic. Not all grades scored higher on all measures, but the results were enough to impress school principals enough to consider changing the school’s recess schedule for next year. • Having just actively “let off steam”, they were a bit more calm and more ready to eat, and with play time done for a while, they could devote more time to eating and socializing. Another thing I love about his study is that it looked at “plate waste”. This is messy research, because it requires the investigators to look at how much food was actually eaten. It’s a dirty job, but I’m glad they did it, because the results are more informative than some other studies that look only at how much food is chosen, not necessarily eaten. That’s significant, because it’s not nutritious until they eat it. More than nutrition: BEHAVIOR benefits, too? A 2014 study done in an Oregon community however, found that the students having recess before lunch drank significantly more milk and were 20% more likely to drink the entire 8-oz. carton of milk than were the students having recess after lunch. Even better: the teachers reported that having recess before lunch resulted in better classroom behavior and greater readiness to concentrate on academics after the lunch period. What I love about these studies is that they really didn’t change the curriculum or even the offerings of the school lunch program. Only the scheduling changed, so that kids were given more activity right before they sat down to lunch. Easy fixes for nearly all schools, and most certainly worth a try, especially because virtually none of the schools offering recess before lunch noted any misgivings or negatives. Finally, remember that kids like to eat stuff that tastes good, but we adults can stand to learn a thing or two about what we assume kids will eat. The kids in the 2014 Oregon school study ate the most fruit when pineapple and cottage cheese was served. Wake-up call here! http://cuttothechasenutrition.com/wp-content/uploads/2016/10/logo10.png 0 0 Keith-Thomas Ayoob http://cuttothechasenutrition.com/wp-content/uploads/2016/10/logo10.png Keith-Thomas Ayoob2017-12-13 09:01:022018-02-13 19:56:27COULD “REVERSE RECESS” IMPROVE BOTH TEST SCORES & DIETS? Healthy holiday eating and enjoyment are not mutually exclusive, IF you know the right tricks. Having a healthy eating style doesn’t have an “on-off” switch and. It’s not about choosing between living in a healthy food monastery, or crossing over to the dark side, where all enjoyment happens. Being healthy is being on a food journey, not on a diet. On a journey, there’s room for everything. Extreme, overly restrictive eating styles aren’t sustainable and most people wouldn’t want to sustain them either. I wouldn’t. But I think of holidays as just another opportunity to hone a better eating style. Keep in mind, my own eating style has evolved over the years. Give yourself permission to evolve a little, too. • “…the kids were off from school this week”. File all these reasons under “stuff happens” but they happen all year long, so make life’s little disruptions amount to nothing more than a minor nuisance. They may even open a new dimension to your eating style or give you different “routines” for each situation. • MOVE MORE! Just make it a part of the fun. Activity is a total ace in the hole. The more you move, the more calories you burn, for sure, but the more fun you can have, too. Moving kicks in your brain’s “feel-good” chemicals called “endorphins” that lift your mood. Walk through decorated neighborhoods, go ice skating, and make sure you dance at all the holiday parties! Feel the fun, not the burn! • Workday “me” time: take 30 minutes of your lunch hour and walk briskly. THEN have a modest lunch and you’ll deserve a little indulgence. Or bank it for tomorrow’s indulgence! • Splurge on some delicious, healthful foods you like but usually deny yourself: smoked salmon and pre-seeded pomegranates, (where all the work is done for you) are two of my faves. Keep grapes and clementines on the counter for a tasty impulse-bite. Gift yourself the convenience of salad-in-a-bag to make sure you and your family have an easy way to get plenty of low-calorie, nutritious foods (throw in some of those pomegranate seeds!). It’s also an easy way to get kids started in the kitchen with simple prep. Try some high-end balsamic vinegar and you’ll need less oil. • Expect the unexpected. If a disruption is likely to happen, keep the rest of your day’s eating smart. Leave 200 or so calories for something unexpected. That way it doesn’t set you back. 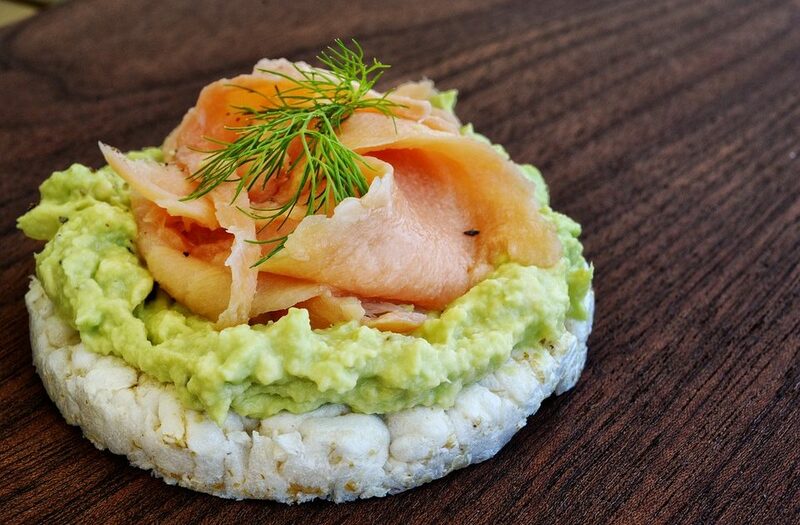 http://cuttothechasenutrition.com/wp-content/uploads/2017/12/smoked-salmon-avocado.jpg 640 960 Keith-Thomas Ayoob http://cuttothechasenutrition.com/wp-content/uploads/2016/10/logo10.png Keith-Thomas Ayoob2017-12-07 08:45:092018-01-30 18:14:10Eat Well During Holidays Without Crossing Over to the "Dark Side"
Thanksgiving is over but we’re now in a full-on holiday food marathon. No one wants to diet or even hear about health until the first of the year. Food is everywhere. Even at work, people are deluged with treats “for the office”. Holiday parties abound, and all manner of family and social functions, each with their respective food character. How much weight do people really gain during the holidays? It was long thought that people gained about 5-7 pounds during the period from Thanksgiving through New Year’s Day. This, plus the obvious psychological milestone of January 1, probably triggered the massive focus on health and dieting at the first of EVERY year. But a recent scientific review looked at studies that included adults, as well as children, and revealed that people tended to gain only about 2 pounds during the holidays. I know, you think that can’t possibly be true, and maybe it isn’t – for you. That’s the thing about these studies – they tend to put everyone into a big blender and get an average. This review did find however that overweight/obese people tended to gain more weight and normal-weight people. You’re not everybody, though. If YOU tend to struggle with your weight during the holidays, then maybe it’s time to do something different than in years past. No holiday weight gain: It’s possible! Maybe no weight loss, either, but that’s OK. Anything better than last year’s results entitles you to beat your chest with pride. How to get there? Think of this as just another “project”, and any successful project starts with a good plan and this one is no different. That said, it can be a fun plan that gives you a nice reward: waking up on New Year’s morning without the weight regrets of seasons past. If the holidays are traditionally a tough season for you, weight-wise, then victory is all about prevention. • Ask about the food and drinks that will be at social events. Plans work better without surprises. • Do a “buffet screening” and filter out one or two things you like the most. Keep the other choices good-for-you ones and eat those first, so you fill up on the low-calorie foods. • Keep it to one caloric drink only. Whether it’s an alcoholic drink or just a soda, minimize your liquid calories. Then, keep to water, seltzer, or diet soda (yes, they’re safe so calm down). Others may get smashed on booze, but you’ll wake up tomorrow feeling better and without the weight gain from the unneeded calories. • Never arrive to events hungry — it’s the ultimate trigger for overeating. • Get fussy about worksite food? If it’s some item you look for, plan for it. bring your lunch and make it a modest one, like Greek yogurt and some fruit or two hard-cooked eggs and some whole grain crackers and zero-calorie seltzer or iced tea. Keep the special food to a “hospital-sized” portion. • Move. More about this in my next post but get ahead of the game now. Do SOMETHING. Anything you do beats sitting still. FINAL THOUGHT: Leave early. If the food is just too difficult to handle, it’s no party for you. Making a timely exit is a sing you’re in charge. Pat yourself on the back! Halloween’s Over, Holidays Are Coming: Need to Curb Sugar Cravings? Sugar seems to have become the new trans fat: the thing everyone feels entitled to bash. Not just added sugar, but even sugar naturally present in food is suspect. See my previous column on “Paleo-inspired baby food”, made without any grains, dairy, even fruit, to avoid babies having a “sugar crash”. Seriously? Surprisingly, we’re eating LESS sugar now, with intake going from 109 grams/day in 2000 to 92 grams/day in 2016, according to USDA data. Still, people still get too much sugar and many say they crave it. Cook County, that includes Chicago, recently defeated a referendum that would have levied a “soda tax”. Get my take on this issue here. What is a sugar craving? A craving is an intense desire for any food that that goes above and beyond biological need. It’s not the same as hunger, which is more physiologically based (think hunger “pangs” and stomach growling). And a craving doesn’t necessarily indicate a dietary deficiency of something. Mother Nature didn’t set you up, we all evolved to prefer the taste of sweet things. Infants only days old will suckle more strongly on liquids that are sweeter. Indeed, breast milk actually has more natural sugar (lactose) than cow’s milk – if it didn’t, infants may not be as motivated to suckle, putting their very survival at risk. Since sugar also helps stimulate fat synthesis in the body, eating more of it than you need when it’s available would help you out during periods of food scarcity. Throughout nature, most naturally sweet foods, such as fruit and honey, are also safe to eat, so sweetness of a food may have also been our clue about its safety. Do you want sugar when you’re stressed? Anything stressful: family matters, time crunches at work or home, relationship issues, can all increase sugar cravings. Indeed, holidays bring up all of the above, along with the pressure to be “happy” when indeed, you just aren’t feeling it. Add in a lack of sleep because of all the increased demands on time and you have a perfect storm for stress-eating whatever your comfort food is. When you’re stressed, your body screams for relief, and sweets are a quick fix. Not the best one, just the quickest. Sugar also stimulates the brain to make serotonin, which helps calm you down, at least temporarily. And, like just about every other thing today, sweets are around everywhere, even more so during the holidays. All those baked goods that aren’t around at any other time of year make us feel entitled to “get while the getting is good”. GO PRO EVERY MORNING: A nice protein load early in the day cuts those hunger pangs that can trigger sugar cravings later, but most people don’t get much protein in the morning. Cereal and milk are a great start, but go further. Have at least a 5-oz. cup of fat-free Greek yogurt or a hard-cooked egg (or two), some string cheese, or a piece of last night’s beef or chicken. SPEND SUGAR CALORIES WISELY: Sugary soft drinks are wasted calories, but low-fat chocolate milk or sweetened Greek yogurt (tip: a teaspoon of honey tastes like more) give you of something rich with flavor that fills some real dietary gaps at the same time. That’s making sugar work harder for you. SUGAR SUBSTITUTES? Calm down about the prevailing culture. The science on their safety is solid as a rock. Evidence shows they can actually be useful tools. More about this in a FUTURE column, so watch this space. For now, resist the mob mentality about these and use them as tools to help cut dietary sugar. PUSH YOUR SWEET BUTTON WITHOUT SETTING OFF ALARMS: When eating out with people, instead of dessert, order a cappuccino. It’ll only be about 100 calories, even with whole milk and some sugar, and you’ll keep occupied while everyone else has dessert. If they offer you a bite or two, take it. You’ll visit your happy place but leave happy, too. SEE IF YOUR TASTE BUDS NEED A RE-SET: Is a fruit salad sweet enough without having to add sugar? If not, your taste buds may have become “dumbed down” from eating too many sweets. A few weeks where the sweetest thing in your diet is fresh fruit and flavored yogurt re-sensitizes exhausted taste buds so you can eat the occasional sweet but enjoy it even more. http://cuttothechasenutrition.com/wp-content/uploads/2016/10/logo10.png 0 0 Keith-Thomas Ayoob http://cuttothechasenutrition.com/wp-content/uploads/2016/10/logo10.png Keith-Thomas Ayoob2017-11-01 06:25:322017-10-31 23:27:00Halloween’s Over, Holidays Are Coming: Need to Curb Sugar Cravings? —The variables: intake of poultry, red meat, seafood and incidence of type 2 diabetes upon follow-up. They divided the subjects into four groups based on intake of shellfish, poultry, and red meat. Then they compared the groups with the lowest intake of meat/poultry/shellfish with groups that had the highest intakes. There are two ways iron exists in food. Iron is either part of hemoglobin (called “heme iron”), as in the case of animals, or it’s bound to other compounds (called “non-heme iron”), as with plants. Compounds like phytates in plants bind to iron to make it less absorbable. Eating plant iron with an acid, like having spinach with a vinaigrette dressing, will help liberate some of the iron, but in general, heme iron is more available to the body. How much iron do we need each day? Adults need 12 mg/day and women of child-bearing age need 18 mg/day, because they lose iron each month they menstruate. Dietary pattern was taken at the beginning and never again. So, what you had for dinner on a Tuesday night 11 years ago predicts your health now? You might be able to get statistics from this data, but drawing any realistic conclusions is making a Grand Canyon leap. People’s diets change over 11 years! Activity patterns were also assessed only once, at the beginning of the study. Those who ate the most red meat ate averaged only about 53 grams daily – less than two ounces! And they still ate more seafood than meat. Those who ate the most seafood also averaged about 33 grams of red meat daily — a little over an ounce! So differences between the HIGHEST and LOWEST consumption of red meat was only 20 grams – about 2/3 of an ounce. Different meat types were assessed (beef, pork, lamb, etc. ), but not cuts of meat, or parts of poultry (legs have more heme iron than breast) or dietary fat. Pork belly has lots more fat than pork loin, for instance. With the difference between the highest fish-eaters and the highest meat eaters being only 20 grams of meat, the difference may be statistically significant but not clinically (“real life”) significant. The “associations” these studies talk about don’t mean “cause-and-effect” but consumers don’t often understand that. and the headlines don’t help much. To get the facts you usually have to read beyond headlines. My take-away from this study? Not a whole lot. And the authors pretty much agree with me, noting, “We do not perceive any reason for meat intake to be related to the likelihood of disease diagnosis in our study population.” Simply put, this study failed to connect meat intake with type 2 diabetes. Game over. Keep portions real. Even 4 ounces of lean meat is going to be loaded with enough protein for your meal. Keep half your plate veggies and fruits. Include a whole grain or a starchy vegetable. Keep added fat reasonable. Olive oil or canola are good choices, rather than butter or coconut oil. In the EdibleRx, I like to keep things informative and simple. I’m not a fan of demonizing foods or food groups. Balance is key, and I believe in making recommendations based on sound evidence – as good as it exists. Food trends come and go – witness the plethora of extreme diet books that have populated bookshelves (maybe even your own) and spurred endless conversations and discussions. When a trend becomes potentially harmful to a vulnerable group, however, I cannot let that slip by. Having spent most of my career working with children and families with special needs, it makes my blood boil when food trends and fads get visited on vulnerable groups. Case in point: Back around 2004 I was called to testify before the House Energy & Commerce Committee, which was examining two companies in particular that were marketing diet pills and supplements for children. One supplement actually used herbs that were contraindicated in anyone under age twelve years. I pulled no punches and spoke the science, the facts, and also my outrage. When you get the ear of Congress people, believe me, it’s not about keeping quiet. It’s about using a professional voice to speak the truth, and making sure it is heard by those who can make changes. That supplement website was shut down, fortunately. I was interviewed September 18th for an ABC News story about a company making Paleo-inspired baby food: free from grains, dairy, and fruit, centered around meat and vegetables. Beef, chicken and veggies are great foods and fine for a meal, but promoting a diet free from dairy, grains, and fruit for infants and toddlers is not. Young children this age need balance and variety from all five food groups. Simple, basic foods from these groups are a nutrient-rich package and round out a balanced diet. In 30+ years as a pediatric nutritionist/dietitian working with children with special needs of all forms, I have yet to see an infant/toddler who had a “sugar crash” from eating strained pears. Period. As for their food, it comes in three different flavors, “free-range chicken, “all grass-fed beef” or “uncured bacon”, each mixed with vegetables and each with either 4 or 5 grams of protein – less than what you’d get from about an ounce of edible beef or chicken (both typically contain about 7 grams of protein per ounce). Squeeze pouches only, sold online in 6-packs. Each pouch is 4-oz. or ½ cup. They call these products “first foods to feel good about” but these are all mixed dishes. You never want to introduce more than one new food at a time. If there’s an allergic reaction, you won’t know which food is causing it. Cost per 6-pack: $26.95, or about $4.50 PER SERVING! For $26.95 you can buy enough healthful beef, chicken and veggies – and grains, fruit, and dairy – and feed your toddler for days, or even buy wholesome prepared baby food. An infant/toddler diet that excludes grains, dairy, and fruit isn’t serenity. It’s insanity. And $26.95 for 3 cups of meat and veggies? Unnecessary food elitism. Good baby food — store-bought or homemade — should be, and IS, far more affordable than this. And even if you buy baby food in pouches, feed it to baby with a spoon. Stay involved. 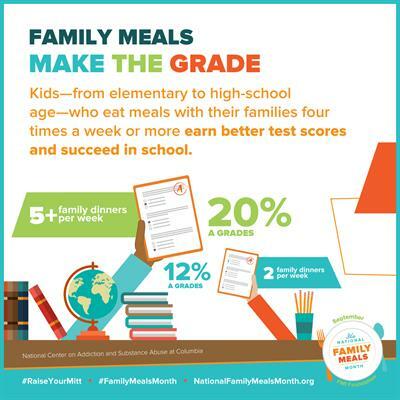 It’s the start of having family meals — one of the BEST ways to feed kids of all ages. Hey, it’s Family Meals Month. Make it happen in your family. THAT make healthier kids. September is National Family Meals Month, and it couldn’t come at a more appropriate time than right now, when kids are back at school, yet for many families affected by weather, a family meal can be the most comforting thing ever. For all families, re-committing to having family meals together is one of the most beneficial things parents can do for their kids and for family life. The practice of having family meals isn’t dead, but there are signs it’s ailing. Families still eat together, but according to a Harris poll cited in a 2015 study on family meals, only 3 in 10 families eat together every night. There’s room for improvement here and there are many reasons to make the effort. A separate study found that eating home-cooked meals most often (even if using some frozen or packaged convenience foods) resulted in eating about 130 FEWER calories for the day, compared to people who cook at home less often or not at all. Those families also ate less fat and sugar. A 2015 study: Kids who grow up having regular family meals are more likely to have more desirable social behaviors (such as sharing, respect, fairness) as adults. A 2014 study: have fewer signs of depression, less likely to abuse drugs, less likely to engage in delinquent acts. Strong association between family meals and higher grades, higher self-esteem, less risky behavior. So…What’s the Barrier to Family Meals? Check the “Life Happens” folder. There’s more demanded of everyone today. Jobs aren’t 9 to 5 anymore. Technology allows (and encourages) us to check work-related messages outside of typical workday hours. Pile on the demands of the kids, their academic, extracurricular, and social schedules, plus the demands of just running a household, and family meal seems like an unnecessary expenditure of time. You kids are worth my time every day. Is there a downside to family meals? Only if the family relationship isn’t strong. It’s also another reason to establish the family table early on as a totally neutral zone for parents and kids alike. No technology. If kids – or patents can’t disconnect for the 20-30 minutes it takes for the family meal, then family meals aren’t the problem, family standards are, and it’s time for a reset. They’ll miss a few texts and posts and they’ll learn the world still spins. Switzerland. The family meal table is a fully demilitarized zone. No fights, no bickering, no lectures. Keep it positive. If social skills need some work, this is the place. Give some guidance, but always with encouragement, not judgement. And ALWAYS give some positive feedback. Kids (and adults) love to be told they’re doing a good job. Table it. Research has associated eating together around the family table, not in front of the TV or in other rooms, with lower body mass index (BMI – a measure of weight-for-height) for kids AND parents. Keep them engaged until everyone is finished – that’s also associated with lower BMIs. Everyone’s an owner. Parents are hungry for prep help! No matter the menu, give age-appropriate tasks for prep and clean-up. Everyone gets dinner sooner and enjoys it more because they have a personal stake in its prep. Big note: tell the kids you appreciate their help. Positive feedback is the ultimate motivator. I love that mom. And thanks to my own mom, for making great family meals — including breakfasts!